​Expedition MembersEric Goulding, Marie Goulding, Anna Lass, Tom Durrant, Sarah Lewington, Alaine Dyer, Sarah Goulding, Mark Robertson, Paul Iverson, Peter Scurry, Betty Scurry, Philip German, Linda German, Darren Sims, Peter White, Dale Hathaway, Sue Hathaway, June Cooper, Denise Waddington, Justine Waddington. In this report you'll learn about the grass roots of BBF. It has all of the history and previous projects that lead up to this first great expedition. This trip was the beginning of great adventures to come. "The charity's objectives are to provide sponsorship which will fund educational support for deaf, disabled, disadvantaged and deprived children in Uganda, in order that these children can integrate constructively, educationally and socially within their local communities. Young people and others in the UK will be encouraged to participate in this sponsorship programme." To develop the sponsorship programme and provide further educational support for our two target schools it was decided by the executive committee to organise and run a fund raising campaign coupled with a working visit to further develop the facilities at the schools. Building Brighter Futures responding to requests from both schools set a target to provide a dormitory block for Kavule Parents School for the Deaf and to complete the classroom block which was started by Scouts in 2000 at the Peace School which has since been renamed Bukeka School & children's centre. The 2006 project and visit was open to any interested party who was prepared to fund themselves and support the fund raising initiatives instigated by the trustees. On the 23rd July 2006 23 people left Heathrow to go on an "African Adventure"
Marie and Eric Goulding first visited Kavule Parents School for the Deaf in 1999 whilst on a study tour to Bulangira Disables Association. (See item 7). The school consisted of a small house which had been converted into a makeshift school and dormitory and as the name suggests was started by concerned parents and guardians worried about the plight of the local deaf children who traditionally would not get any education. The 7 children were poorly clothed, sleeping on the floor and walking 2km to fetch clean water. ​Marie immediately set about trying to improve the conditions at the school and appealed to her scouting colleagues in Surrey to help raise some money to put in a new well to provide clean water. This was soon achieved and in August 2000 Eric & Marie witnessed the commissioning of the well. At this time they introduced a scouting colleague Steve Hall to the school and he also set about raising funds through his contacts and through Surrey Scouting. In 2004 enough money had been raised to build a new school on an eight acre site a short distance from the original building which is now used as teacher's accommodation. 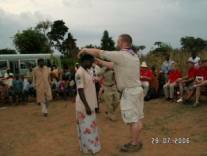 Surrey Scouting, through Steve Hall, raised ten thousand pounds and another charity, Deaf Africa fund, provided approximately six thousand pounds. 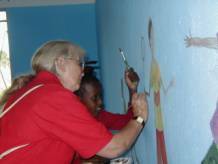 Eric recruited five young volunteers in 2003 via a Youth Volunteering Scheme (Waverley Youth Action) and led the 2004 visit over the Easter period to put the finishing touches to the school by funding and applying a good coat of paint! The volunteers were so moved by the plight of the children and the dedication of the teachers that they set about raising more funds after setting up their own charity "Building Brighter Futures". "To provide funds to build a new dormitory block and fit it out with beds and mattresses". Following the 2004 visit it was noted that after classes had finished the class rooms became the dormitory with children sleeping on the floor having no personal space and very little privacy. The matron had put up a makeshift partition to offer her some privacy. However this structure severely cut down the space available for lessons. The arrangements for sleeping were cramped and the storage of bedding etc obviously impinged on teaching conditions and did not facilitate a good learning environment. Building Brighter Futures had set a target to raise funds of just over £9300 to achieve its objective; these figures were based on estimates supplied by Kavule School. The trustees and expedition members worked very hard fund raising and exceeded the target figure thus allowing money to be spent on further development. This provided extra support for the education and well being of the children. Once on site the BBF team set about providing the necessary cash and started organising the outstanding work which had halted due to lack of funds. Local builders started immediately with the brief to complete the building before we left in one week's time. Electricians set about the wiring and many labourers were digging trenches, mixing concrete and cement whilst we set about painting the interior. Work moved on at a fair pace, not always in a logical sequence but the urgency to complete the project had motivated everyone. The building was soon transformed from a ramshackle building site to a nearly completed dormitory. Although the finishing touches and the final connection to the mains power would take place after we left we had the satisfaction of seeing the interior decorated and personalised by Jo, Wendy and Denise. And to our great joy, finally the morning of the official opening the first ten beds were delivered and installed despite the paint on them still being tacky! Job done or was it? Every day the Director of the school Sam Kateu called Eric to a meeting and it became evident that finances at the school were very tight and Sam personally was solely responsible for any emergency or shortfall. ​The project was now paid for and finished all but the finishing touches but Sam was looking for more! As in most parts of Africa water harvesting in Uganda is important but no provision had been made to collect this valuable resource from the large roof of the dormitory, Sam called it an oversight however the truth of the matter is he did not like to ask for even more after my lectures on proper estimating and his "Oliver Twist" tendencies. 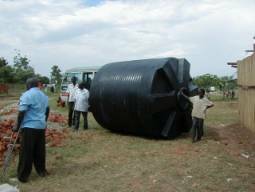 The estimated cost of providing a concrete base, guttering and huge collecting tank was £1854.00, the trustees were informed that this tank would not only save a lot of time it would lessen the instances of bullying that was common by the local children picking on the deaf children at the well. This expenditure was agreed and a tank ordered from Kampala which was delivered before we left. Sam called a management meeting and it was heartening to see how the school was managed first hand. The committee consists of nine people who include four parents, the local council official who is also the chairman and other local people. There is a finance sub committee which vets all expenses and the money sent by Building Brighter Futures can only be withdrawn from the bank account after the finance committee has made a recommendation to the full committee and then three signatures are required to withdraw the money. During the meeting various problems became apparent and Building Brighter Futures was asked to help. 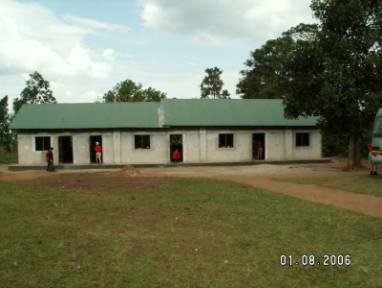 Building Brighter Futures is pleased to report that it was able to support the education and well being of the children by funding all of the above as well as £10841.00 to complete the dormitory block. Kavule Parents School for the Deaf received a total of £11676.00 in addition to sponsorship for several children's school fees from our sponsorship programme. Bukeka School and Children's Centre was formerly known as "The Peace School" and was started by the director Livingstone Mpagi after inspiration and encouragement following a trip to Uganda by a group of Scout Leaders in 1995 .The name "Bukeka" is Livingstone's father's family name and the school is named in his honour. After the death of his father, Livingstone found himself in control of ancestral land in his remote home village near Mityana. As a life long Scout he dreamed of being able to provide a facility in this rural area where the orphans and children of the poor subsistence farmers could go for an affordable education. With the support of a few friends and a Scout group in Reigate the first school was built in 1996. The building consisted of grass walls and eventually a tin roof which lasted until the termites ate the supporting poles! In August 2000 a group of Scouts, which included two of our 2006 members camped at Mityana and physically started to build a brick structure which was the basis of our project this year. ​The 2000 project, a really practical experience! How we found it in 2004 complete with dirt floors! ​Small amounts of money have been sent out since 2000 and have financed a new pit latrine and provided exercise books but there has never been enough to complete the fabric of the building. With 192 children on the books, no desks, very few books and no doors to keep things safe it looks like a job for Building Brighter Futures. "To provide the funds to complete the building to a standard that is equal to that of Kavule Parents School for the Deaf". The trustees of BBF had originally agreed to spend £1000.00 towards the completion of the school, however the fund raising for the 2006 projects had exceeded all expectations so we were able to forward enough funds to allow the builders to complete the structural work such as laying the floors, fitting heavy duty metal doors, new windows and completely plastering inside and out. When the group arrived it was a real shock to see a completely transformed building in full use by over 190 children. The team set to and using the experience gained at Kavule started the preparations for painting. First task to remove the children! The team worked hard, the atmosphere at Mityana was very different as the children all had good communication skills and it was a pleasure to paint to the sound of children singing outside. A week later after a trip round the local tea plantation and factory the job was done complete with flowers and new black boards. As at Kavule we soon realised that there is no cash flow and the school survives day to day due to the generosity of the director who has to fund any shortfall. A meeting was held to understand the ongoing problems and the following immediate problems were discovered. These requests amounted to £1433.00 which Building Brighter Futures was able to fund in addition to the £2016.00 spent on the building. 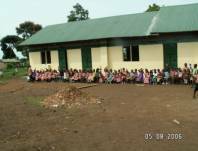 Bukeka Children's Centre and School benefited to the total amount of £3449.00 plus £130.00 spent on school fees from our sponsorship scheme. The Bulangira Disables Project is not a Building Brighter Futures initiative but featured on the 2006 visit as it has historical connections to the Kavule School for the Deaf. The Bulangira project started after Peter & Betty Scurry spent a week in the area during a Scouting visit in 2000. Peter and Betty took up the challenge to raise funds and build a vocational training centre and as the project leaders and prime motivators have not only succeeded in purchasing the land they have funded and built a fine centre for the disabled of Pallisa district. During our stay at Kavule, Peter & Betty organised it so that every day at least three of our party had the opportunity to visit the Association and take part in various local activities including home hospitality and Scouting. The whole team attended a traditional Scout Campfire which was enthusiastically led by Mark while Philip supported the whole teams singing with his guitar! Mark presented a new Scout Leader with a neckerchief from his own group the 8th Farnham (Rowledge). The trip itself was totally self funding with all costs being met by the individuals who made up the team. The visit benefited by a raise in the value of the pound against the Uganda shilling and this meant that our money went further, consequently, apart from personal spending and social drinking everything else including sight seeing was paid for from the £1500.00 paid for the trip. The budget worked out very well and we did not need to use the contingency fund therefore the surplus from this fund has been paid into the general funds of Building Brighter Futures. Prior to the trip, expedition member's, trustees and many other interested parties had set about raising the necessary funds to allow Building Brighter Futures to complete the objectives set out previously in this report. The response from everyone was overwhelming with cheques arriving daily from members of the public, businesses, friends, relatives and a huge contribution from various branches of Scouting across Surrey and Berkshire. The grand total has now reached £16263.00 with still more promised in the near future. Building Brighter Futures, on behalf of the children at Kavule and Bukeka say a heart felt thank you and request that you spread the word that the money was well spent and has improved the lives and well being of very many children. Building Brighter Futures 2006 visit can only be described as a fantastic success, 23 unrelated people who self selected themselves to join this trip, worked together as a team, socialised and bothered to get on within a diverse group. Together the team endured the joys and frustrations of Africa always in good humour and with a huge smile. The objectives and projects that the team set out to achieve were all successfully completed. In addition to the main projects, supplementary projects and other support for the schools were identified and completed. All of the team achieved a great deal both in personal development and in the support and furtherance of the well being and education of the children at our two target schools. No future commitments have been made to either school by BBF apart from agreeing to continue to develop the child sponsorship scheme, however the following items on the next pages were presented to us for future consideration, it is up to you the reader to decide if you would like to support BBF in any of the varied and worthwhile new challenges. Sustainability is the big issue for the school with less than 3% of the children paying the proper school fees. A properly organised sponsorship scheme is top of the priority list for Kavule to ensure a regular income. School fees at present are just under £20 per term. This item was surprisingly important at both schools. The need is to protect their compound and prevent local children entering and taunting the deaf children, to prevent people stealing crops, water, and to stop locals grazing their cattle when the school was not in use. A charity based in Finland has provided £6000 pounds towards a new classroom block, however this was a one off payment and has resulted in a building being left only part built, not waterproof and not able to be used . No estimate has been provided for completion but judging from our previous experience it would take at least £5000 to bring it up to the same standard as the rest of the school. Despite having good buildings, basic furniture and other resources are in short supply. The request has been for 20 benches, 20 chairs, 25 desks and 5 office tables. Deaf children do require a higher than average teacher: student ratio, the recommendation is 4 children per teacher. Therefore the requirement is funding to increase the teaching staff by 7 making a total of 10. Some of the teachers require extra training and support with tuition fees is sought. This item was surprisingly important at both schools. The need is to protect their compound, to prevent people stealing crops, water, and to stop locals grazing their cattle when the school was not in use. Sustainability is the big issue for the school with few of the children paying the proper school fees. A properly organised sponsorship scheme is top of the priority list for Bukeka to ensure a regular income. Due to a problem last year with a misunderstanding about a proposed sponsorship scheme, school fees at present are unrealistic at just under £2.00 per term. However the target is to raise them to £20per term as the facilities and a proper sponsorship scheme is introduced. With an ever increasing number of children a further 4 classrooms are required to compliment the 4 completed by Building Brighter Futures this year. The teachers at present either live in the surrounding villages or in the traditional house on site. The house on site is said to be 100 years old and needs to be demolished and replaced with a brick built structure .The school is at least 50 minutes away from town so accommodation for teachers is very important if continuity is to be achieved. In order to raise finances and help sustainability the school would like to start a brass band. A volunteer teacher has been identified who would train the children but there is a need for a complete set of instruments. This scheme is based on one running at the Outspan School near Kampala and has proved to be very successful. The rural setting of the school makes it difficult to have the basics like clean water and a reliable power source. Power could be provided by Solar panels, generator or overhead supply. Power would enable the school to extend its opening hours and be used in the evenings as well as being able to have modern facilities like computers. There are many projects to do in Uganda at both our target schools, some big and some small. Building Brighter Futures welcomes anyone who feels that they would like to get involved in any way, either by raising funds or by joining us on our next trip! The sponsorship scheme is vital for both schools to help achieve sustainability, could you help find some sponsors to give £5.00 per month? This easily managed initiative will have far reaching benefits in improving the standard and resources in the classroom. Building Brighter Futures will offer help, support and encouragement to anyone committed enough to join in and have a go, look what has been achieved this summer. Many of the 2006 team will continue to work towards achieving even more and completing some of the new projects, but how can you help them? Building Brighter Futures is committed to helping the children in Uganda but strives to have a good time doing it! Why not join us? Telephone 01252 725656 to discuss how you can get involved.